May 20th, 2013 | News and Events, Wheaton World Wide Moving. There are some people who save every receipt for every purchase they make. Others don’t keep receipts for anything. Then there are those in the middle – they might save a few here and there, mostly for big purchases. During the moving process though, it is important to be in the first category of people: save every receipt for every purchase you make regarding your move. touch up your house, getting new appliances, or purchasing moving supplies. It’s important to save all of these receipts because you never know when someone might want proof that you purchased something, especially if the purchase is being reimbursed. 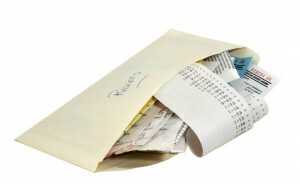 There are some easy ways to help organize all of these receipts that you will be accumulating. One way is to store all of them in the moving notebook that we blogged about a few weeks ago. Another way is to scan all of your receipts and store them on your computer. There are also some handy apps for smart phones that allow you to store all of your receipts in one place after taking a picture of them. There are obviously a large variety of ways that you can organize these receipts and make it easy for you to remember where they are stored. Do you have any organization ideas that could make this process easier? Be sure to check out the rest of our moving tips!